Ready for another fun and fresh spring beverage that not only tastes great but looks beautiful? Perfect for all your outside refreshment needs, we whipped up a fresh batch of Patriotic Tea Punch, courtesy of Sams Club Recipes! The light and crisp flavor is from cranberry juice and tea mixed and the fruit can be popped right into the drink for decoration AND eating! 1. Combine water, juice and Lipton® Lemon Sweetened Iced Tea Mix in pitcher. Add fruit; chill 1 hour or until ready to serve. Serve over ice and garnish, if desired, with additional skewered fruit and mint. *Tip: Toss a few apple slices with lemon juice and reserve for garnish. Combine water, juice and Lipton® Lemon Sweetened Iced Tea Mix in pitcher. Add fruit; chill 1 hour or until ready to serve. Serve over ice and garnish, if desired, with additional skewered fruit and mint. Looking for other EASY beverage recipes like this that make for a fun summer? You can check out our Watermelon Agua Fresca and then head to Sams Club for more printable summer recipes that your whole family will love! Celebrate spring with delicious food! With the weather getting warmer it’s a great time to get outside and enjoy some good food with friends and family. Celebrate this spring with a picnic or fun gathering and fresh recipes from some of your favorite brands. I suggest starting with dessert first! I love tea. This looks so good! This looks like such a delicious and refreshing drink. I will have to try making some this weekend. Thanks for sharing! I love combining various types of fruit and water – this one sounds yummy! This is such a great drink for summer. I can not wait to make some of this in the upcoming summer months. I am sure my kids will enjoy it!! Thanks so much for sharing. This looks so good and the fruits are a really nice touch. I will have to try it …I think this would be great for the pool! No one is more excited about fresh fruit season than me. I’m loving all the new choices at the store right now, since the weather’s warmed up. The tea recipe sounds like a great way to use ’em! Although this beverage looks yummy I would love to try the Watermelon one you linked to in your post. I love these fruity drinks in the summer! This sounds and looks like an awesome tea drink for summer time fun. I will be trying this for sure this summer and may try it for my sons grad party too. Thanks for sharing. Thank you for sharing this Patriotic Tea Punch Recipe. It looks like a healthy and delicious way to cool down this summer. I love making punches during the summer! This sounds amazing I can’t wait for bbq’s to pair up with drinks like this! Okay this looks really delicious! What a great idea to do a patriotic tea. Sounds lovely! 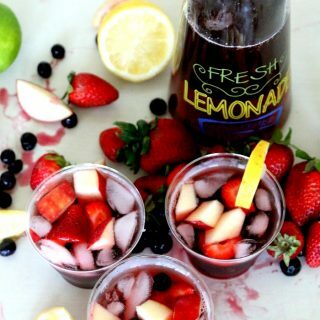 I love the use of all the fresh fruit in this drink. I think the juice would give it a bit of tart. This tea punch is so rich in flavors with a lot of friends. It’s natural sweeteners make this one really healthy. That sounds so refreshing! 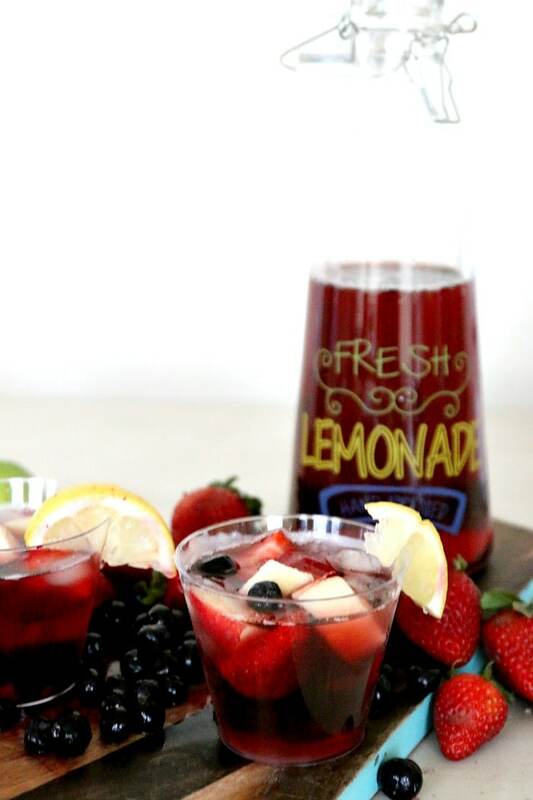 The fruit with the sweet iced tea will make a great looking drink for outdoor parties this summer. This sounds like one delicious beverage! I know my husband would love it. He is a big fan of Lipton tea and cranberry juice. That looks so cool and refreshing! I’m sure it would be perfect for those lazy days by the pool. This sounds delicious – a great twist on traditional iced tea and it’s even just fun to look at! This looks really good! Thank you for showing us how to make this. It will go great at our next bbq! Appreciate you sharing this! Passing it along :). Ooh how fun is this. I have to try this with both cranberry juice and pomegranate juice. I love all of these refreshing summertime drinks…they really get me in the summer mood. I also love any drink that contains strawberries, as it’s my favorite fruit. That looks really amazing with all of the fruit in it. We love sweet iced tea with raspberries so I’m sure this would be a hit in our home. Thanks for sharing.